Simon Says Stamps. I really had a lot of fun with some of these products~Thanks to my blogger friends, Mona from Cupcake Creations and Lisa from A Mermaids Crafts who have inspired me to give this a try. Be sure to check out their blogs for inspiration......they are AMAZING! I started with a white card base. The base layer is pattern paper from My Mind's Eye and I have distressed the edges with the DIA. 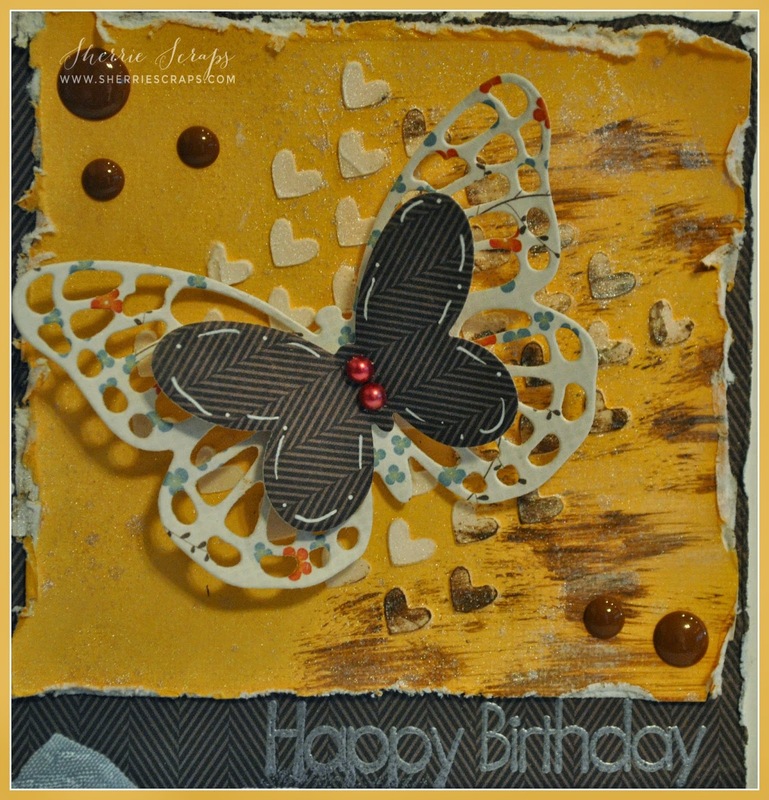 The yellow panel was cut and using a fun Stencil~Balloon & Patterns from Simon Says Stamps along with Texture Paste created a textured background. Once it dried, I added some color using TH Walnut Distressed Paint and then finished with Ranger Perfect Pearl Mist for a shimmery look over the whole panel. The beautiful butterfly is SU Butterflies Thinlit's Dies which I have used foam dimensions for additional dimension. I embossed the sentiment from My Creative Time's Card Sentiments stamp set with Sweet Stamps Pearl embossing powder. I also added some cute little enamel dots that were in my stash. I finished with a decorative border using a punch from Recollections and tied on a pretty bow with 3 Girl JAM crinkle ribbon. So gorgeous! 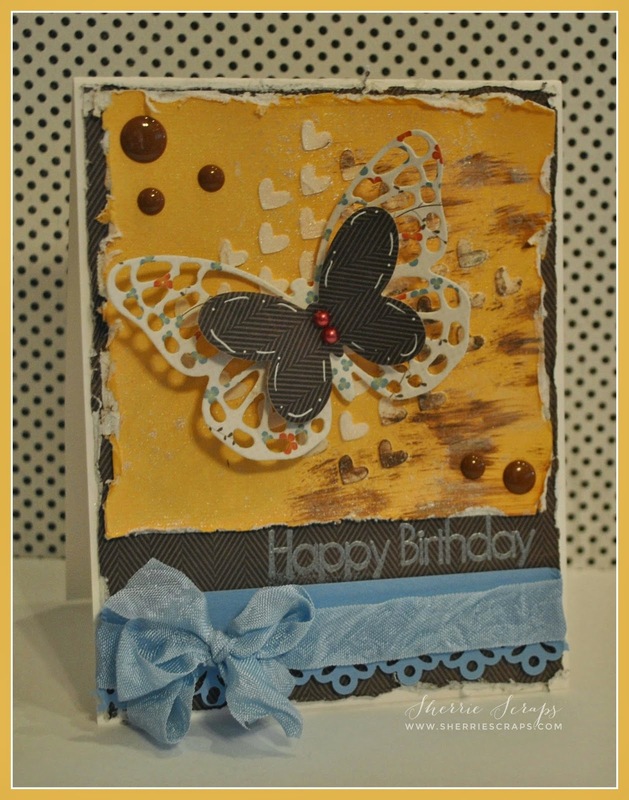 LOVING the colors and the layered butterfly!!!!!!!!! I love Sherrie!!! The butterfly is super and I love the colors the bow of course and all the texture you have added, It makes me happy looking at it!!!! Thank you for joining my DL.ART Thankful Thursday Anything Goes MARCH Linky Party. Have a blessed day and a wonderful weekend, my friend . you have some beautiful grandchildren. 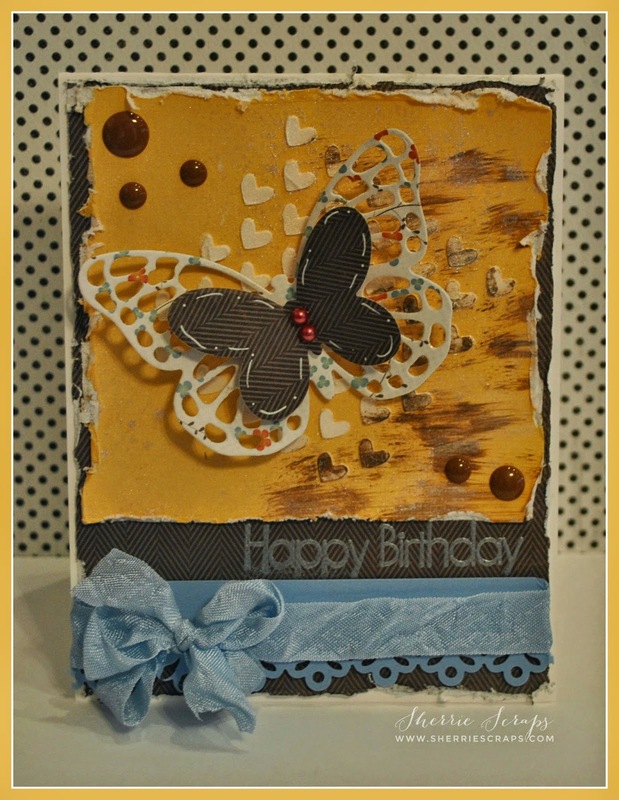 Beautiful card Sherri, so much dimension and texture,I don't want to forget your distressing, gr8t job! What a gorgeous card Sherrie! Love that butterfly!!!! Hope all is well with you and the family!!! Have a GREAT Friday and weekend my friend! This is really, really lovely! I hope you have a wonderful weekend! Oh Sherrie this turned out beautifully! Love it! Have a fun week end! This turned out perfectly! Looks amazing! Love the texture! Hoping you are enjoying your weekend! This is fantastic! I am in love with these colors! and all the texture is so AWESOME! What a GREAT bday card! I hope you are enjoying your weekend! I think your boys are away this weekend and so are mine! Fishing :) I've been having a very relaxing and crafty weekend. That makes me so HAPPY! It's super hot here so I've been happy to be inside where it's cool. Well I hope you are having a blast whatever you are doing! Take card my sweet friend! Wowzers - this looks amazing Sherrie! Love the distressed edges and great texture. Embossing paste has become one of my favorite new toys- gives such great texture and the supply of stencils is just endless! A beautiful card my friend!! Awesome texture and pretty bow! !Gorgeous butterfly!! Awesome job on this card!! Beautiful card. Love the colors, all the textures and that stunning butterfly my friend. Lots of great techniques on your card. Love the colors. I am trying to experiment with other techniques too. You have a few I need to try! What a beautiful card!!! Love it!! Have a great day. Ahhh,you got the Butterfly Thinlets!!! Good for you! Aren't they fun? Your card is adorable, as usual my friend! Take care. Sherrie ~ Oh my this is just GORGEOUS! The colors are such a BEAUTIFUL combination and then the distressing ~ I need to pull out my distressing tool! Well my sweet friend ~ I think Spring is arriving sooner than we thought ~ TG!! right?? It was BEATUFIL today ~ I had the windows open trying to get the germs out of my house ~ Ha!! Gorgeous card Sherrie! So elegant and pretty, I love how you've layered the butterflies. This is such a pretty card. I love the lacy butterfly!! Such a beautiful card! The butterfly and colors are wonderful! Thanks for joining us at 3 Girl JAM! Ohhhh, this looks fantastic!! Love all the distressing! How fun that you got new product too. (Blogging friends can be a bit TOO enabling!) You did a fabulous job with things! Super pretty! Love the way you did the background. Thanks for linking up at 3 Girl JAM challenges!